This year the Ars Electronica festival, which took place from the 7th to the 11th of September, has been the setting for over 600 events such as exhibitions, conferences, concerts and workshops, and as usual it attracted visitors and artists from all over the world. The events in this edition circled the Artificial Intelligence theme, discussing the relationship between the AI and the human being, examining the expectations, fears and recent realities, arising deep matters such as ethics, morals and spirituality. The main questions that emerged in the several symposia concern how much the new technologies influence our culture and our society. Questions were asked on how to consider the machines’ creativity and what should the right way to account and use such artificial identities be. All fundamental and pertinent questions in our times more and more submerged in this reality, of which we keep on asking what could the potentials and the risks be. The works presented, and mostly the award-winning ones, investigate these elements. 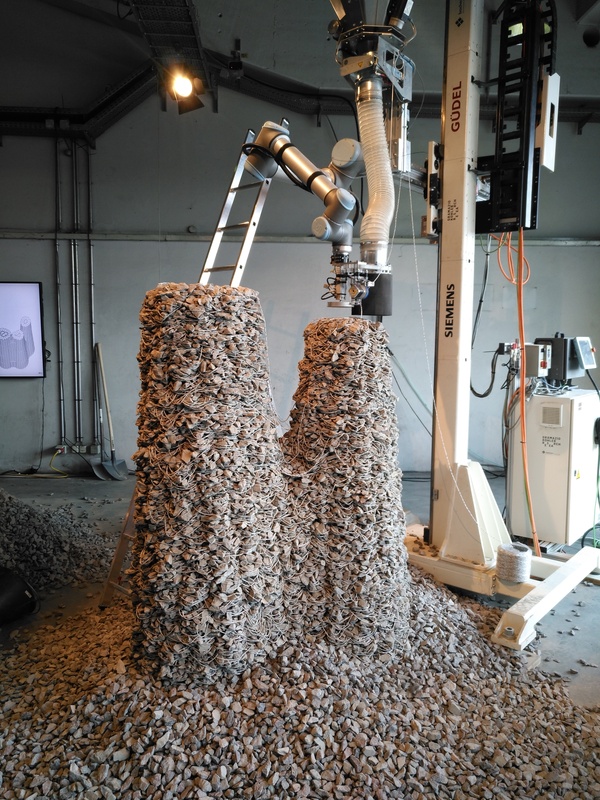 The artwork “Rock print“created by the collaboration between Gramazio Kohler Research, ETH Zurich and Self-Assembly Lab MIT and winner of the STARTS 2017 award consists in an architectonic structure made exclusively of little pebbles and a metallic wire, held together by the compression of the elements: the metallic wire is placed on a robotic arm following an algorithm created by the research group, while the pebbles are manually poured on layer by layer inside a container cage. When this process is terminated the cage is removed and the excess pebbles fall off, giving room to the solid structure. The artwork won the award because of the researchers’ capacity to unite robotic building technologies, 3D printing and self-assembling as a completely innovative approach to architecture design; for this reason the structure is thought to be completely built in totally recoverable and easily reusable materials and the project managers will keep on experiment on this subject to value this method’s use in more complex and resistant structures. This project looks at the substitution of manual work with a self-assembly robotic one. 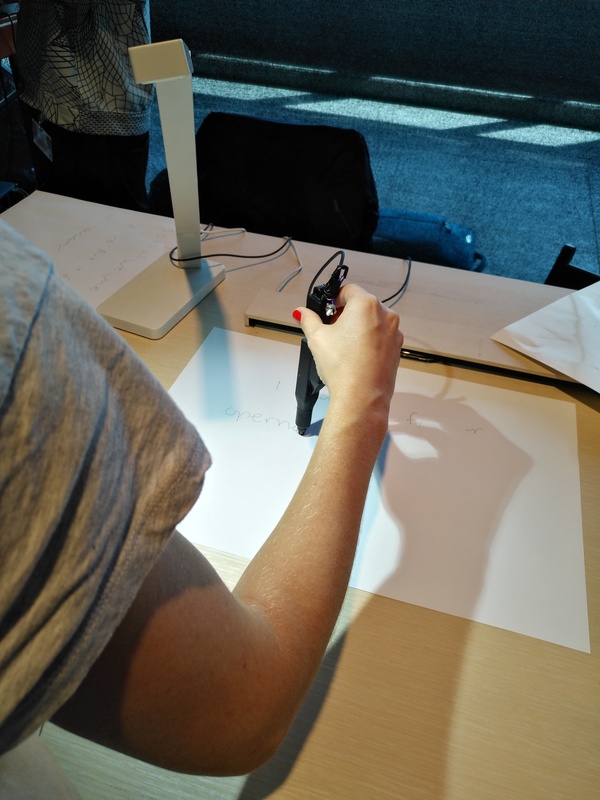 The second artwork to win a STARTS award concernes the new possibilities to record and transmit data, researching and exploring the technology’s influences, potentialities and perception. The artwork, named “I’m Humanity”, was created by artist singer and producer Etsuko Yakushimaru from Japan. It consists of a pop song made using a biotechnology system: it has been produced using an acid nucleus of the cyanobacteria Synechococcus. The musical information was then converted into a genetic code from which a DNA sequence was pulled out; the DNA was successively incorporated into the microorganism’s chromosomes, able to self-replicate continuously. As so the musical information will keep on existing and transmit itself even if humanity should come to an end, since DNA is capable to transmit a stored information for thousands of years, making it a really powerful recording vehicle. The song “I’m Humanity” is therefore the first one in history to be produced in a digital distribution format and in a genetically modified organism. The jury awarded Yakushimaru’s work for her abilities to move from many different worlds and languages such as media art, pop culture, poetry and theatre, science and many more. Nonetheless this project and its creator permitted the communication between pop culture and important scientific institutions, working as a bridge between these two realities and permitting to carry out bioart knowledge towards the crowd. 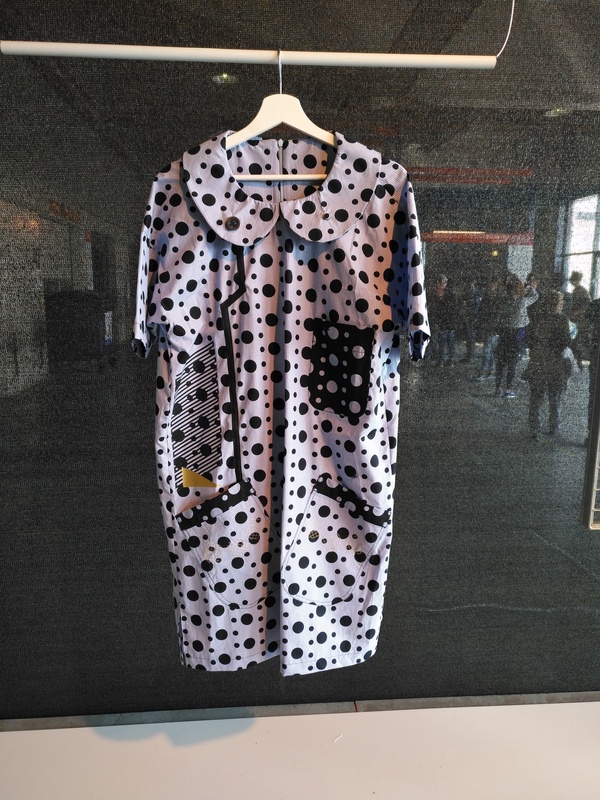 Many other interesting works have been nominated in the STARS 2017 award section; among these for example is the project “Speculative, Fashionable, Wearable” by the Japanese fashion designer Kazuya Kawasaki, whose focus was on researching the possible union between fashion design and new technologies. 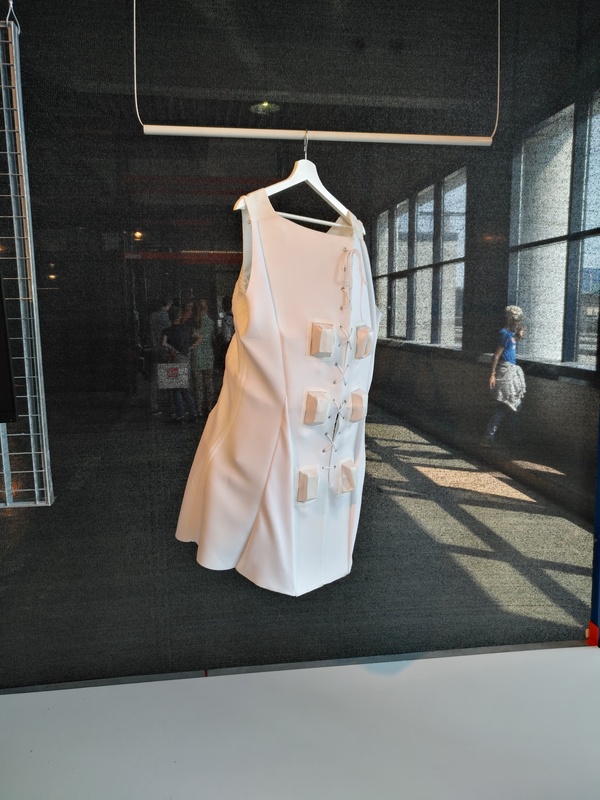 The result is a wearable technology, featuring “intelligent” clothes able to answer to the person’s needs and to model the appearance to go along with the aesthetic tastes based on the place the person finds himself in. Another interesting study can be found in “F.o.G- Face on Globe” of the Japanese artists Daisuke Iizawa and Shunji Yamanaka of the Tokyo University. The project analyzes the interaction between man and artifact, starting from our tendency to identify faces in inanimate objects and based on the fact that us humans tend to interact more naturally with a robot if it looks like us. The two engineers designed a spherical robot, being the sphere a shape that has nothing whatsoever resembling a human, able to modify its shape if observed, in order to record the reaction of the spectator based on the shape taken by it. The goal is to balance the behavior of the robots and the expectations of the spectator thanks to the design. Another project from the University of Tokyo by the artist Kotaro Tanimichi together with Shunji Yamanaka is “al-dente”, sees the artists work on a new material created with the 3D printer, able to be solid and flexible at the same time, thanks to its stratified wave structure; the potentials of this study sees the possibility to create one day objects we can’t even imagine now, choosing the material and its level of flexibility. 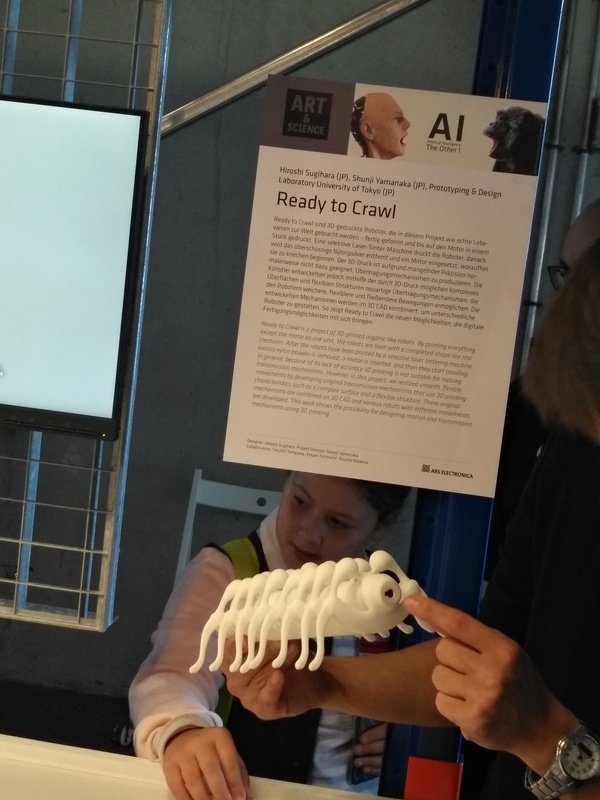 Still from Tokyo and around the potentials of 3D printing, the project “Ready to Crawl” was presented, consisting in robots printed in one single block but with a flexible structure, which enables them to move in a fluid and naturally appearing way. 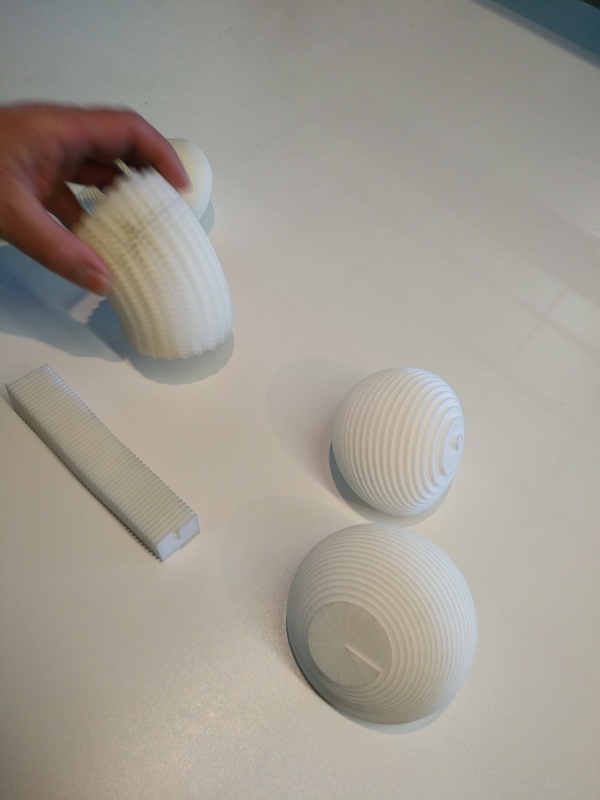 The artists are studying a way to build mechanisms with high quality movements thanks to the 3D print method’s characteristics. 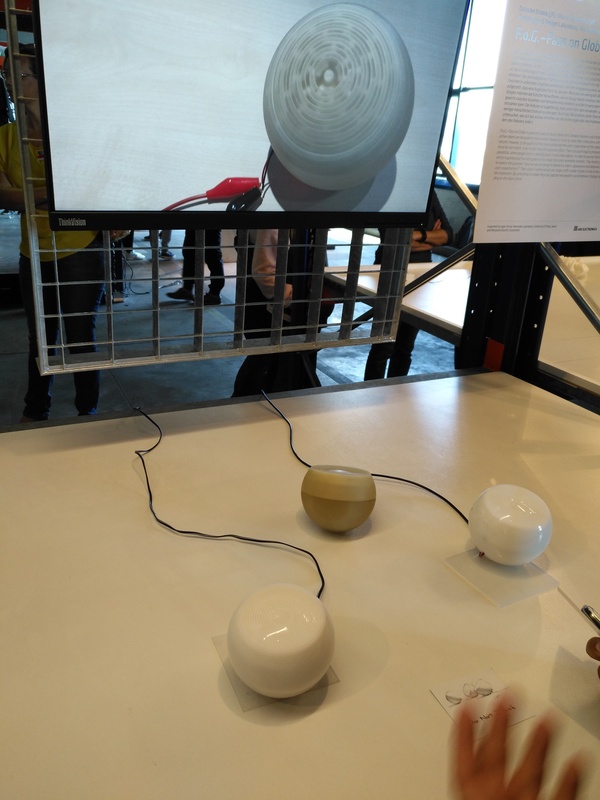 In different expositions artists have studied a very interesting subject: the capacity of the AI to “learn” and “create” analyzing the human products and behavior. 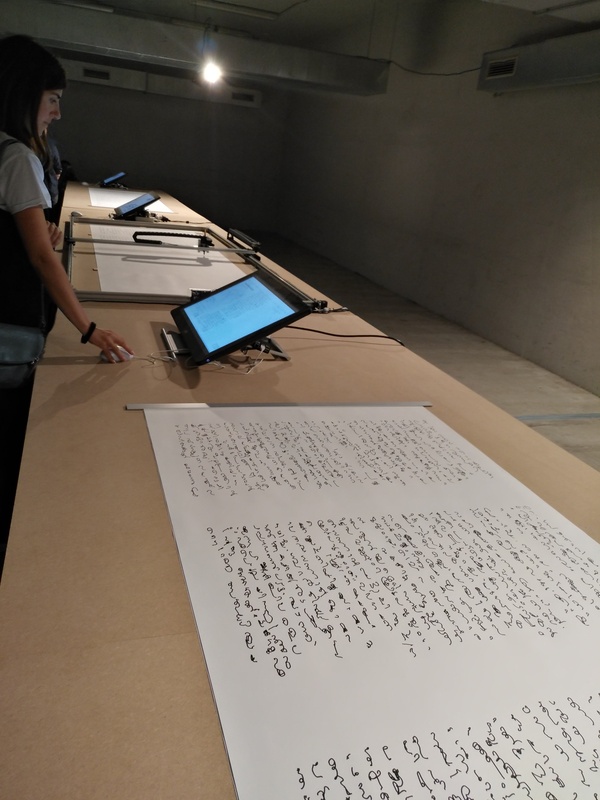 It’s the artwork “(author)rise” ‘s case, by the artists Harshit Agrawal, Junichi Yamaoka and Yasuaki Kakehi, where we see a machine write following the thoughts of the person and copying his or her movements to eventually take control of the pen and keep on writing. This AI, trained on a large scale of human writing and philosophical texts, uses our involuntary movement to keep on writing phrases that make sense. The artwork pushes the person to question how the machine’s ability to take over and momentarily substitute our mind affects us. This machine in fact takes decisions for us; it is given the chance to act on our body, using our hand to write its own “thoughts”. All this makes us think also about the “property” of the elaborate, being this physically produced by our hand but thanks to the machine’s will, who takes inspiration from other authors’ works and is itself driven by the programmer who created it. Another work based on writing is “Asemic Languages”, by the artists So Kanno and Takahiro Yamaguchi. Their AI has memorized different ideograms from different languages enabling it to create new characters through which it is able to write texts that are apparently meaningful and deceive the eye. In reality this new language makes no sense whatsoever. In the different expo settings of the festival, as it happens every year, many other artists have been able to express their vision and update us on the surprising developments regarding the Artificial Intelligence theme, maybe the most complex and fascinating one to date for us all.